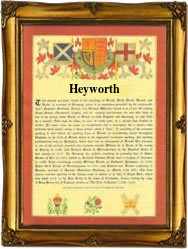 Recorded in the spellings of Haywood, Heyworth and the much rarer, Hayworth, made world famous by film star Rita Hayworth, this is an English surname of great antiquity. However spelt it is locational from either of two places called Heywood in the county of Lancashire or Heywood in the county of Wiltshire. The former derives its spelling from the Olde English pre 7th Century "heah", meaning high, plus "wudu", a wood; hence, "the high wood". The latter, recorded as "Heiwode" in the 1086 Domesday Book, means "the enclosed wood". Locational surnames, were usually acquired either by the lord of the manor, or by former inhabitants who moved to another area, and were thereafter best identified by the name of their birthplace. In Baines "History of Lancashire", we are told that "the estate of Heywood was granted by Sir Adam de Bury to Peter de Heywood in 1276". Other later recordings include: Alse Haywordd, which in Middle English was pronounced 'Hayworth' who married Henry Gibbons at St Andrews church, Enfield, Middlesex, on June 26th 1608, Hesther Heywood, who was christened at Chippenham, in Wiltshire, on May 1st 1670, whilst John Hayworth married Mary Suthard at Christ Church, Greyfriars, city of London, on January 28th 1812. The first recorded spelling of the family name is believed to be that of Adam de Heywode. This was dated 1246, in the "Assize Court" rolls of Lancashire", during the reign of King Henry 111 of England, 1216 - 1272. Throughout the centuries, surnames in every country have continued to "develop", often leading to astonishing variants of the original spelling.